Looking for a healthy crunchy chocolate treat? I’m obsessed! 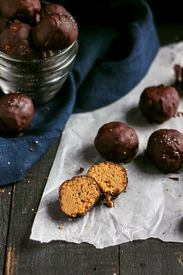 Incredible dark chocolate coated crispy peanut butter truffles that taste like a crunchy peanut butter cup. The crispiness comes from toasted quinoa! Naturally sweetened, gluten free & vegan-friendly.